Early plan of San Francisco City, California. 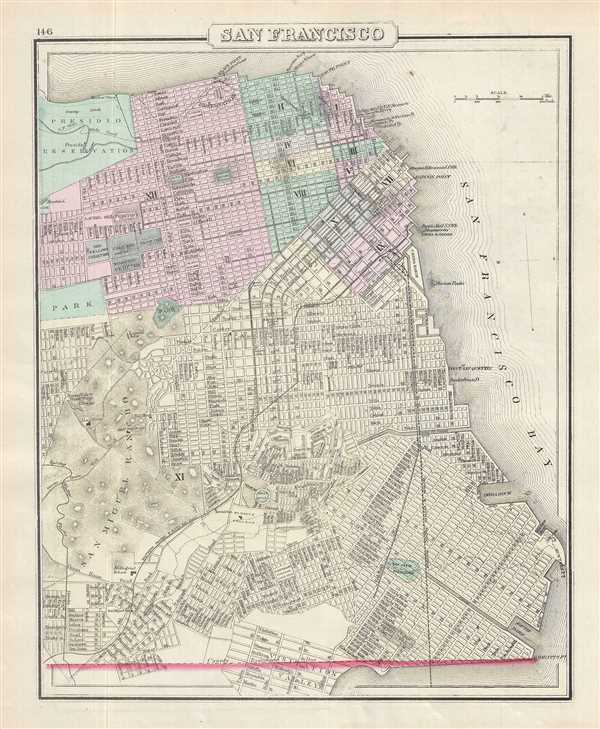 This is a beautiful 1878 Gray map or plan of the city of San Francisco, California. It covers the entire city from Visitation Valley north to Presidio Park. The map is extremely detailed, showing individual streets, important buildings parks, cemeteries, schools, piers, railways and other important landmarks. Various topographical details are also included with elevation shown by hachure. This map was included in the 1878 edition of Ormando Gray’s National Atlas. Gray, O., The National Atlas. Containing Elaborate Topographical Maps Of The United States And The Dominion of Canada…, (Washington), 1878. Very good. Minor spotting. Minor creasing near left border along height of map.